ET Intelligence Group: The swelling flow of domestic funds in the local equity market raises concern over its stickiness. But, data pertaining to the proportion of assets under management (AUM) and household savings in the GDP indicate that the flow may remain intact in the medium term. 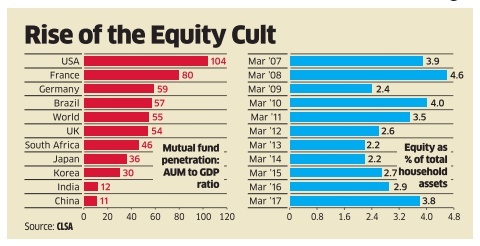 The total AUM of domestic mutual funds is 12% of the GDP as compared to the global average of 55%. The penetration level is even lower for equities. Equity AUM to GDP ratio in India is 4% compared with the global average of 29%. CLSA, an MNC broker, estimates that the share of equity in total AUM may rise to 45% from the current 35% in the next five years.Another brokerage, Morgan Stanley in a note released in May 2017 said that domestic mutual funds will be the largest contributor to a coming boom in equity savings, at $216 billion (Rs. 14 trillion) compared with $ 45 billion over the past 10 years. He added that the current monthly average inflow of Rs. 9,000 crore is likely to sustain. Another key factor that signals sustained domestic funds flow is the increasing acceptance of Systematic Investment Plans (SIP).The number of SIP accounts increased to 1.45 crore in June 2017 from 68 lakh three years ago. In FY17, of the total mutual fund flow of Rs. 43,921 crore, 72% was collected through SIPs. Despite the rising interest among households in equities, the ratio of equity saving and GDP remains low at 0.7% compared with 2.4% in 1992 and 1.5% in 2011.Morgan Stanley expects the ratio to grow to 1.4% of GDP by 2026. This means equity savings could expand to $420 billion during the period.